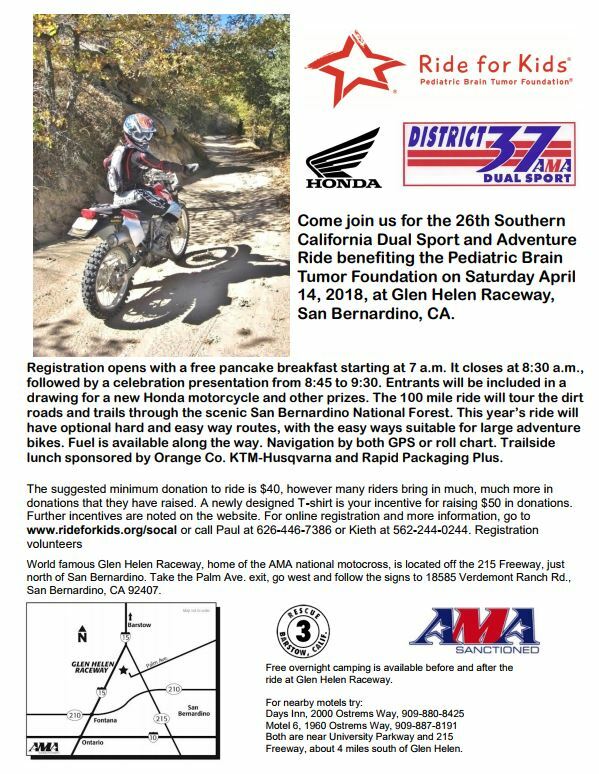 Come join us for the 26th Southern California Dual Sport and Adventure Ride benefiting the Pediatric Brain Tumor Foundation on Saturday April 14, 2018, at Glen Helen Raceway, San Bernardino, CA. Registration opens with a free pancake breakfast starting at 7 a.m. It closes at 8:30 a.m., followed by a celebration presentation from 8:45 to 9:30. Entrants will be included in a drawing for a new Honda motorcycle and other prizes. The 100 mile ride will tour the dirt roads and trails through the scenic San Bernardino National Forest. This year’s ride will have optional hard and easy way routes, with the easy ways suitable for large adventure bikes. Fuel is available along the way. Navigation by both GPS or roll chart. Trailside lunch sponsored by Orange Co. KTM-Husqvarna and Rapid Packaging Plus. The suggested minimum donation to ride is $40, however many riders bring in much, much more in donations that they have raised.